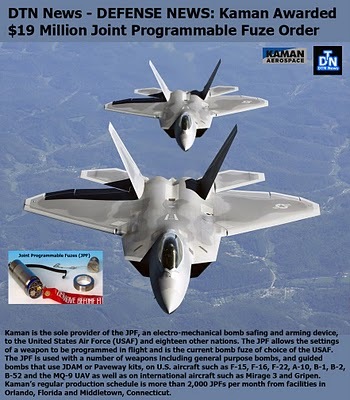 Kaman Corporation announced that its Aerospace segment has been awarded a commercial sale purchase order for Joint Programmable Fuzes (JPF) in the amount of $35.5 million for an undisclosed customer. Delivery of these fuzes is anticipated to occur in 2013 and 2014. “This order is an endorsement of the functionality and reliability of the JPF and we are pleased to expand the relationship with our current customer base,” stated Kaman Aerospace Group President, Greg Steiner. Kaman is the sole provider of the JPF to the United States Air Force (USAF) and twenty-three other nations. The JPF allows the settings of a weapon to be programmed on wing in flight and is the current bomb fuze of choice of the USAF. The JPF is used with a number of weapons including general purpose bombs, and guided bombs that use JDAM or Paveway kits, on U.S. aircraft such as F-15, F-16, F-22, A-10, B-1, B-2, B-52 and the MQ-9 UAV as well as on international aircraft such as Mirage 3 and Gripen. Kaman produces the JPF at facilities in Orlando, Florida and Middletown, Connecticut. Kaman Corporation, founded in 1945 by aviation pioneer Charles H. Kaman, and headquartered in Bloomfield, Connecticut conducts business in the aerospace and industrial distribution markets. The company produces and/or markets widely used proprietary aircraft bearings and components; complex metallic and composite aerostructures for commercial, military and general aviation fixed and rotary wing aircraft; aerostructure engineering design analysis and FAA certification services; safe and arm solutions for missile and bomb systems for the U.S. and allied militaries; subcontract helicopter work; and support for the company’s SH-2G Super Seasprite maritime helicopters and K-MAX medium-to-heavy lift helicopters. The company is a leading distributor of industrial parts, and operates more than 200 customer service centers and five distribution centers across North America. Kaman offers more than four million items including bearings, mechanical power transmission, electrical, material handling, motion control, fluid power, automation and MRO supplies to customers in virtually every industry. Additionally, Kaman provides engineering, design and support for automation, electrical, linear, hydraulic and pneumatic systems as well as belting and rubber fabrication, customized mechanical services, hose assemblies, repair, fluid analysis and motor management.